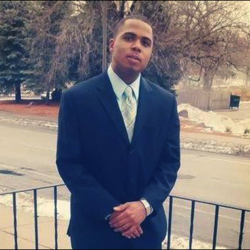 Thuman Blevins Jr., 31, of Minneapolis was fatally shot by Minneapolis police Saturday in north Minneapolis following a foot chase through an alleyway.. He had several gunshot wounds, according to an autopsy report. Police were responding to at least one call that a man was firing a gun, and found Blevins sitting on the curb with a woman. Minneapolis Police Department officials say Blevins brandished a black and silver gun before he was shot. A neighbor who lives on a street next to the alley said she heard Blevins yell, “I don’t have anything. I didn’t do anything. Leave me alone.” She then exited her house, believing it was her son’s voice, and then heard approximately 10 gunshots. Body cam video, embedded below confirms this account. Ivan Deloya, 16, told the Minneapolis-based Star Tribune that he saw officers chasing Blevins, who had a bottle in his hand. Authorities said Sunday that a black and silver handgun was recovered from the scene. Authorities were interviewing witnesses and planned to release the officers’ names after they provided statements. Several people disputed the police account and called for transparency. The Minneapolis NAACP wrote in a Facebook post that witnesses said Blevins didn’t have a gun and had been drinking out of a cup. The group also called Monday for body camera footage to be released quickly. Hennepin County Attorney Mike Freeman said that his office is still gathering evidence and will determine whether the two police officers who shot and killed Blevins in a north Minneapolis alley last month should face criminal charges in the 31-year-old’s death — rather than a grand jury. On July 31, 2018, it was anounced that officers would not face charges for this killing.